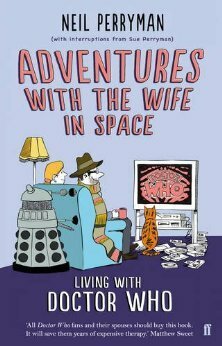 A while ago a good friend thrust a book into my hand called Adventures with the Wife in Space: Living with Doctor Who. Which was written by +Neil Perryman and in part his wife Sue after Neil, a lifelong Doctor Who fan convinced Sue to watch every episode of Classic +Doctor Who with him and record her thoughts on each episode in his blog. He even convinced her to look at the episodes that don’t actually exist anymore. The so-called reconstructed episodes that make up a large amount of both the +William Hartnell and +Patrick Troughton seasons, which don’t exist because some thoughtful people at the +BBC archives decided the tapes should be reused to record one man and his dog or just wanted to shelf space. The reconstructions have the odd clip in them ( generally thanks to the Australian censor trying to protect the humble Aussi), lots of stills footage , generally some one narrating them and the audio tracks form the episodes. Once in a while they have even been animated or CGI’d by fans in order to make them a little less of a chore to watch. Indeed if Sue Perryman had cited been made to watch them as cruel and unusual punishment she could probably have got a quickie devoice. But watch them they did. As well as the rest of the 26 classic series of everyone’s favourite mad man in a box. The whole experiment was recorded faithfully in the blog and readers encouraged to comment on Sues various pronouncements and observations. Many of which were the source of much mirth and merriment. Once they had finally finished this grand opus Neil wrote about the whole experiment and his own life which has occasionally been influenced by his fandom of the time lord, in the book which my friend forced upon me about two years ago. It was a great read, not least because Neil and myself are of similar age and recollections of the Tom Baker years along gave me some common ground with the book. It was also tremendously funny to read about the whole experiment. the kind of thing only +Doctor Who can throw up. As well as Sues ever delightful view son doctor who episodes there are a plethora of her views and opinions on other things. Also Sue herself is an interesting character, having built her own house and been the one who puts up shelves in the Perryman house hold. The whole book had me in stitches quite often and was tremendous fun. So I recommend it to anyone, particularity any Doctor Who fans out there. As I would also recommend reading the blog. Which leads me to why I am writing this now, apart form my passion for independent publishing which should be clear to anyone who reads this blog. My good friend thrust another book in my hand this weekend. 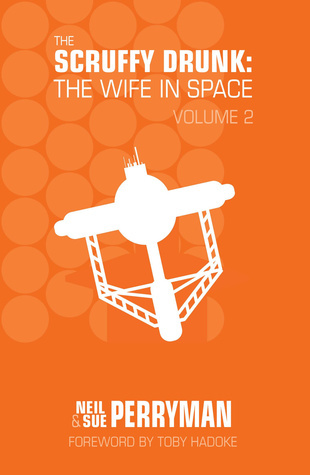 Due to an error at the printers the first run of The Scruffy Drunk , the blogs about the Troughton series was composed of books which were falling apart. So Neil send out replacements to everyone who had received the dodgy run. A fine philanthropic gesture which probably dipped into any profits SueMe were going to make form there limited run. the consequence being I had the second doctors blog book thrust upon me for free. Note. unfortunately for Sue a few lost episodes were rediscovered recently and she had to sit through those again, because, well you have to be completest about these things don’t you. Since then Neil and Sue have gone on to watch and blog the whole of +Blake Seven as well as other scifi shows in a series of blogs and books. As well as currently turning there original blog into a series of books, One for each incarnation of the doctor. These are been produced by SueMe books the couples own independent publishers in a short press via kickstarter campaigns. Fairly successful ones that that as they seem to be fully subscribed very quickly. The latest one of which is for the +Jon Pertwee years or as Sue calls him , The pompous Tory . So in true independent publishing review style I thought what the heck I will read it, and then found it next to imposable to put down. If your a Who fan, then I recommend both the original book , and the blog . I also recommend the Blogs in print versions. Which I am probably going to have to buy myself now. These are a treat, Sue and Niel are a fabulous couple and the Wit of Sue is endlessly entertaining. This entry was posted in book reviews, books, writes. Bookmark the permalink.